The Prochem Galaxy is great for people who want a professional carpet cleaning machine but need it at a competitive price. This machine is incredible value for money because of its reliability and the quality of cleaning it provides. With the Prochem Galaxy's compact design and lightweight yet hi-tech construction, the new Galaxy packs a powerful punch. 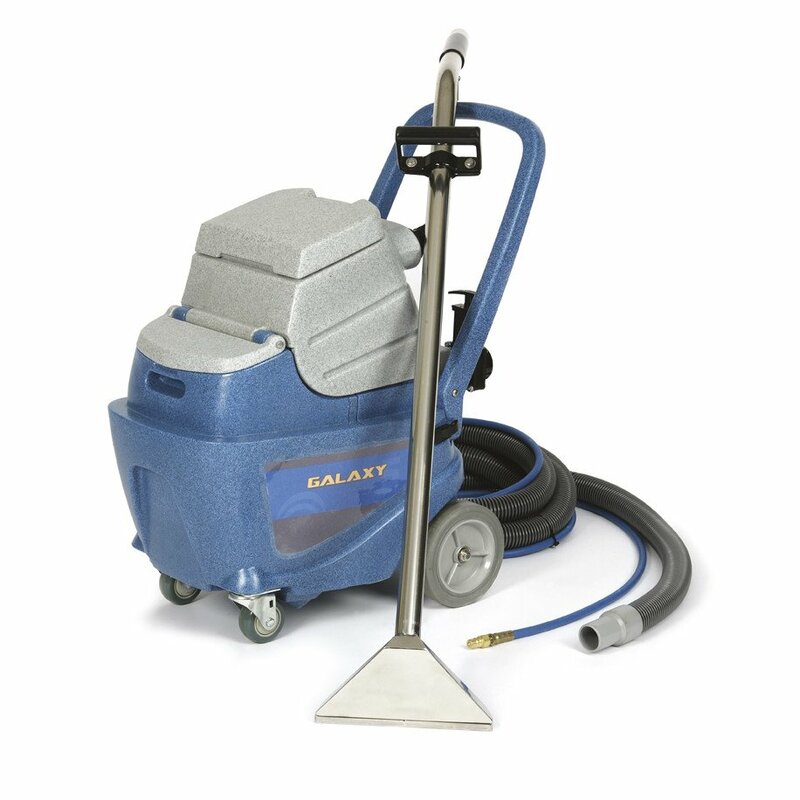 With a powerful 2-stage vacuum the Galaxy delivers the same cleaning performance as much larger machines. The new Galaxy is perfect for in house cleaning as well as car valeting, spot cleaning and small area commercial cleaning. This machine also comes with a FREE carpet cleaning training course worth £110.00. The Prochem Galaxy AX500 carpet cleaning machine is a portable extractor that is a perfect for the cleaning of carpets, rugs and upholstery in both residential and commercial situations. Because this is a wand extraction machine it allows the operator to clean around furniture and obstacles, you can get into awkward spaces and allows you to pay particular attention to stubborn or specific areas of bad staining. This machine is often purchased by, contract cleaners, carpet cleaners, residential and nursing homes, letting agencies, valeting, flood and fire restoration, schools, children’s nurseries and domestic users. With the right chemical the Prochem Galaxy can deal with almost any stain imaginable. The principal of how carpet cleaning or extraction machines work is very simple; if you have dirt or a stain in your carpet or upholstery it can be difficult to remove especially if the soillage has dried in. The most affective and cost effective way of removing this is with a carpet cleaning machine, it works by adding water (preferably warm water) mixed with a chemical that can vary depending on the type of stain, through a spray nozzle so that the liquid is distributed evenly. For best results you would then agitate the carpet ether with a brush or with the wand or had tool. The water and chemical will aid in lifting the dirt and act as a vehicle to remove it from you carpet or upholstery. You then use the vacuum on the machine to lift the water and dirt out of the carpet or upholstery and it is then stored in the machines recovery tank ready for you to empty and dispose of. This is a very simple machine to use, for best results we recommend using an extraction cleaning chemical called Prochem Extraction Plus. You add this product into the clean water tank ideally with warm water. There are two switches on the machine, one to activate the vacuum motor and one to activate the water pump. Once these are both active, use the trigger on the carpet wand to spray the water and chemical mix onto the carpet and drag the wand backward so that the vacuum can lift the moister and the dirt. This will leave the carpet nearly dry. Drying time varies depending on the pile of the carpet and the ventilation in the room, but as a rule of thumb most carpet will be dry within 5 – 8 hours. Drying time can also be increased by using an Air Mover to circulate the air in the room and can be as quick as 2 – 3 hours. The dirty water is then deposited into the dirty water tank or recovery tank. It is incredibly important to use a defoamer in your dirty water tank, we recommend Prochem Liquid Deafoamer. It only needs a cap full and it will reduce the foaming that can occur. The reason this is so important is that it there is a lot of foam in the machine it can be sucked into the vacuum motor which will damage it and void your warranty. It is also important to note that you should never add this to you clean water. Once your recovery tank is full of dirty water, you can use the convenient dump valve at the back of the machine to empty the water ether into a bucket for disposal, of directly out if you have the facility. In addition to this, it is also important to keep clean water reservoir separate from waste water and to this end we also recommend the use of different coloured buckets such as the red and white Prochem CN3503 buckets shown at the bottom of the page, the red being used solely for waste water and the white just for clean. Any vacuum motor returned for repair or warranty claim that shows any sign of dirty water ingestion or rust will not be replaced since the Terms & Conditions of Warranty have not been adhered to. Vacuum motor -1 x 2 stage by-pass. Water lift / Air flow -3556 mm (140 inch) / 70.7 l/s (150 cfm). Hose assembly- 4.6m (15 ft). Carpet wand- 25cm (10 9inch) single jet. Tank construction- polyethylene with aluminum base plate. Wheels rear stair climbing -18cm (7inch) non-marking. Front castors -6cm (2.5inch) non-marking. Power cable- 7.6 meters (25ft). Q. Does the price of this machine include the wand and the hoses? A. The price includes 1 x 4.6m hose and a single jet wand. Q. Can I use the Prochem Galaxy Carpet Cleaner with an inline heater? A. You cannot use an inline heater with the galaxy range, only the Steempro range of cleaners. Q. What are the waste tank and clean tank capacity? A. The capacity of the solution tank is 18 litres and the capacity of the recovery tank is 12 litres.